Tom made his 1st Love with a heart for my Parents 50th Wedding Anniversary. It was much larger, made to sit on a shelf or hang on a wall. Then he began reducing the size for jewelry. 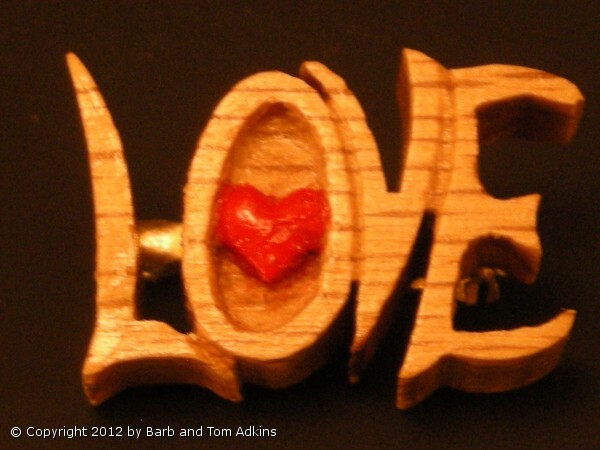 The heart is Hand Sculpted as a very tiny Relief into the "o", then painted red. Tom does this with dental scalpels. This is not laser cut. Each hole in the letter has to have a whole drilled into it and then a new blade is inserted into that hole so the inside of the letter can be shaped. Custom Designed Font so the letters touch on both sides. The Heart can be also be fully 3 dimensional with no background. This can be either made as a Necklace or a Pin. This can be made out of Walnut, Purple Heart, Bubinga, or Oak. What ever your heart desires.